Hi everyone. This is a pre-post since I am up in Maine and on my way home today. Tomorrow I'll fill you in on the good or bad news about our hockey team. So I created this page in a little different style for me. The background is just a page I used up some extra paint on, which is why it might look a little messy. The focus is really on the center image. Once the paint dried I used a stencil and some white paint to create this art deco image. Then I added the orange flowers which are actually skins that I made by painting the flowers on Yupo paper and then covering them with gloss gel medium. Once dry they can be peeled off and used. The lady is a stamped image that I fussy cut and colored. Then there's a lot of TH paper cuts, as well as a few little sticky craft gemstones. 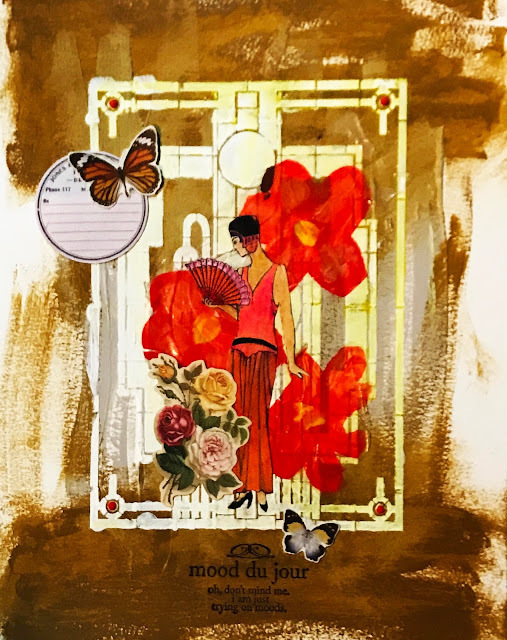 Making pages out of my normal style is certainly an art adventure, so once again, I am linking up to Art Journal Journey. I am hostessing this month and I hope to post every day this month. So far so good. If you are having any art adventures or any other adventures, please join in the fun.Our theme this month is New Year: New Adventures. And BIG THANKS to all of you who have joined us already. The background and the main image go together perfectly and I love the idea of your acrylic skin on Yupo flowers.. how cool ist this?! You are so inventive! I am curious about the hockey game result ! Hope you have a safe drive back home and thank you once more for your terrific hosting of the month! And happy start into a good new week ahead for you as well! I like these colors together, and I like your design with that carefully composed lady centered in the piece -perhaps she's being tempted by adventure as things get less controlled the further away from her they are. This may be out of your comfort zone, but I love it. I especially like the art deco and the way you tied it all together with the flowers and butterflies. I like the sentiment. Maybe I need to try on a few moods, too! Thanks for sharing this with us at Art Journal Journey. You have ROCKED this month as our host. Your page is very elegant. I wasn't aware the background color was messy. The focus is on the woman and flowers which really pop. The background tones things down and ties things in. Imnsho. Hope you have a great time on your road trip and are back in time for the Patriots' game this afternoon. Hope you got home safely and the hockey news was good. Wow, this looks gorgeous, I love the art deco style of the page and all the great layers of images. This is so beautiful! I love your flowers and that awesome stencil, too!